I attended a tech talk last week on node.js by Ryah Dahl. The video of the talk is up on YouTube. Notice the signature of the function: input arguments and a callback when finished. There are never blocking operations in node, everything which might not complete immediately is a callback. dns.isIP() calls into C++ code, which makes a series of inet_pton(AF_INET*) calls to figure out if the argument is a valid numeric IP address. I've omitted the C++ code here, we dive into a more interesting example below. // ANNOYING: In the case of mDNS domains use NSS in the thread pool. // I wish c-ares had better support. Node.js has two ways to implement support routines in C++. If the C++ code is structured to be asynchronous with a callback, it can be launched from the main thread using libev. Node.js makes heavy use of async I/O for this reason. 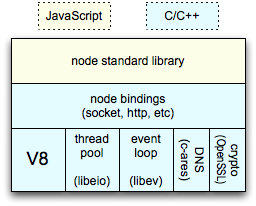 Blocking C++ calls are handled by a pool of worker threads, which send an event to the main when their operation completes. In this code snippet the 'local' domain is handled by the thread pool as a special case, because c-ares doesn't handle mDNS. We'll come back to the thread pool code path later, after examining the common case. Argument unwrapping and validity checks when traversing the interface from one programming language are always tedious. You can never predict when someone will copy the channel.getHostByName invocation out of the standard library and mess with it, and you'd like the framework to do something sane no matter what they do. Resolve is the function the worker thread is supposed to call. AfterResolve is the callback function in the main loop which the worker thread should trigger when done. Node.js makes it easy to develop high performance applications by not offering APIs which would drastically lower performance. Everything is a callback, there are no blocking calls in the API (except for initialization calls such as module loading). Where the underlying C++ implementation is also based on callbacks, this is straightforward. Where the underlying C++ code would block, the implementation becomes a somewhat more difficult exercise in thread management.